Currently Showing on ORCA Channel 15, in the Central Vermont area: Wed Jun 22 at 7pm, Thu Jun 23 at 12am and 1pm, and Sat Jun 25 at 10am. "The Music of Turlough O'Carolan: Festival Preview"
On a perfect day in June, over 75 friends, acquaintances, and friends of friends gathered at the beautiful Worcester home of designer and builder John Mallery and his bride of one year, Fran Purcell Mallery. Some musicians came from as far away as New Hampshire and Maine. The sky was blue, the air was cool, the fields and forests surrounding the river were a rainbow of greens, and the music was phenomenal. That is, if you consider music written in the 1600s to 1700s by an Irish harper named Turlough O’ Carolan your cup of tea. Clearly, those gathered at Mallery’s farm did. As far as we know, it was the first (correct me if I’m wrong!- As far as I know; I did a Google search and thru the first 6 pgs. only Irish & ours turned up!- Elizabeth) festival in the nation devoted entirely to this composer’s music. Yet his name appears throughout the canon of Irish music. There are two Carolan Festivals in Ireland. The program began in mid-afternoon with John Mallery on keyboard, Fran Purcell Mallery on recorder, Art Edelstein on guitar, Helen Husher on hammered dulcimer, and Emery Hutchins on concertina. They were joined in open sessions by other musicians as they arrived. Carolan was an itinerant Irish harper who lived from 1670 to 1738. Music was passed on from one player to another by ear in those days, with nothing written down. Not that written music would have helped Turlough Carolan, who was blinded by smallpox when still a teenager. He learned to play the harp after that life changing event. The harp or clairseach— once a sacred instrument played only by kings and members of their high courts- was given to him so he could make a living in spite of his blindness. Music gave Carolan a rare opportunity for a poor Irish peasant to visit and commune with those of wealth and power. Carolan had many patrons, and the majority of his tunes include the name of the patron he was playing for at the time he wrote the tune. He was very successful for his time. He married, had children, and lived a fairly comfortable life. In his later years, friends gathered to play his tunes. They were transcribed for the first time by Edward Bunting at the Belfast Festival in 1792. To date, 214 of Carolan’s tunes are on the “official” list of Donal O’Sullivan. While he composed his tunes exclusively for harp, others have translated the pieces into the proper keys for other instruments including the uilleann bagpipes (just being invented while Carolan was at his peak), the guitar, and concertina. Those keeping track at the Worcester festival tell me that in addition to the popular Sheebeg and Sheemore, 42 different Carolan compositions were played (a few more than once). Tune-centered workshops were led by John Mallery, Art Edelstein, and others. Some met under trees, some under the big tent, some in the barn or in the house. Everyone seemed to want to attend every workshop so there was quite a bit of ebb and flow during the sessions. A talk by Art Edelstein on the Life of Turlough O’Carolan followed. Elizabeth Hunt Schwartz and George Drewadded Irish step dancing to Carolan tunes late in the afternoon. A wonderful and varied pot luck followed. The Festival ended with a bonfire to usher in the Feast of St. John. Additional information about Turlough Carolan can be found in Art Edelstein’s biography of Turlough Carolan, Fair Melodies, with a CD of 21 Carolan tunes; available at http://www.noblestonepress.com/ . Piano is not common to Irish music. When it is heard on record or in concert it usually plays a secondary, rhythmic role in this style of music. Thus, when a solo piano CD of Irish music is released it makes a stir. John Mallery of Worcester recently released "Carolan Connection," a solo piano recording of the music of Turlough Carolan. This is a fine collection of 24 of Carolan's melodies, by a non-professional musician whose dedication to this music is obvious. Carolan was a harper and composer who was born in 1670 and who died in 1738. He was blinded by smallpox in his teens, given a rudimentary education on the harp and, at age 21, set off onto the muddy back roads of County Roscommon to make his fortune. He traveled by horse cradling his harp in a sealskin bag, led by a guide. He would eventually become one of the most important musical figures in 18th century Ireland. While born a low-class Catholic during the Protestant Ascendancy, Carolan would perform and compose music for the wealthy and high born, be they Catholic or Protestant. He would know many of the powerful people of that era and many of the 219 melodies now attributed to him would be named after his famous patrons. Mallery has spent 20 years or so studying and playing this music. He has visited Ireland several times to soak up the culture. While he doesn't gig, he does play regularly with friends in a group called NIPS. He is an architect and builder by profession, but it is obvious that he has spent a lot of time at the piano thinking about how this music translates from harp to piano. In some respects, the harp-to-piano translation of music that fits neatly into the neo-classical style and has its roots in both ancient Ireland and Baroque continental Europe is not a difficult one. Each instrument has a part for the left and right hand. While one hand plays harmony or chords, the other delivers the melody. For Mallery, as for any person trying to play Carolan's music on an instrument with chordal potential, such as guitar, the problem is choosing the best harmonic interpretation as this music comes down to us only in melody. There is virtually no hint as to how this music sounded when Carolan played it. We can thank Edward Bunting for notating the music. He did this in July 1792 at the Belfast Harp Festival where the few remaining traditional harpers performed. Bunting, a musical genius, notated each melody. He was inspired to make the search for Carolan's music his life-long ambition. His work inspired others. However, it wasn't until the early 1960s, when the band that eventually became the Chieftains recorded a Carolan melody, that anyone outside of a few devoted Irish musicians got to hear Carolan in a setting other than the harp. The music quickly caught on, and today, hundreds of albums around the world from Ireland to Japan contain melodies of this obscure Irish composer's music. Mallery's CD should do a lot to introduce Carolan to a wider audience. He has chosen mostly accessible tunes in the Baroque style. Some of the composer's other work would sound odd to our ears, as it is ancient in derivation. For those totally unfamiliar with Carolan, this music is unlike anything you are likely to hear from contemporary bands such as Altan, Dervish or Patrick Street. There are no jigs here and the music has a decidedly classical sound. It also sounds timeless and many of the melodies could be used in movies with a love theme. Mallery's album includes the popular Carolan melodies "Sheebeg and Sheemore," "Fanny Power," "Morgan Magan" and "Eleanor Plunkett," as well as the less-known "Grace Nugent," "Miss Murphy," "Sir Charles Coote" and others. He plays with great sincerity and dedication and the recording by Colin McCaffrey captures the piano well. This could be a revelatory CD for those who have never heard Carolan's music and whose interest has been piqued. In 2007, at Mallery's instigation, a Carolan festival was held at his Worcester farm. About 75 Carolan diehards attended and the result was a day of workshops, informal and formal performances and a lot of networking around the music. The day's events were videoed and a film was made that is currently being aired on ORCA the public television station. The second annual festival is scheduled for Saturday also in Worcester. Those who want to learn about this music or who already play, said Mallery, are encouraged to attend. The program will air on ORCA (Channel 15): Saturday at 8 p.m.; Sunday at noon; Monday at 5 p.m.; Tuesday at noon; and Friday, June 20, at noon. It’s late June in Worcester, Vermont; home of the Annual Carolan Festival. Turlough O’Carolan, a growing favorite among folk musicians around the world, was an Irish harper in the 1600’s and 1700’s. His tunes have been adapted to many styles and instruments; all celebrated here, in his honor. I enter the barn, and approach the back door deck, where it opens up to the main tent - back-dropped by a panoramic view of glorious green mountains. Musicians unzip or snap open their instrument cases among the chairs, and the sound of varying notes gliding off from strings carries on the breeze. There are fiddles, guitars, harps, dulcimers, bodhrans, guitars and an Irish bagpipe. They tune up for the many performances listed in the “very flexible” schedule of events handout. Potluck dishes stream in and fill shaded tables and coolers off to the left. Beach chairs are set up by the tent, as some stroll beneath it to sit in the shade, while others choose the open deck off the back of the barn. Finally, musicians assemble and take their places on stage, as the last adjustments are made to the sound system. An open session begins the annual Carolan Festival of Worcester, Vermont – hosted by John Mallery. A Carolan favorite SheeBeg SheeMore, headed by John Mallery, on the keyboard, is rendered harmoniously with fiddles, guitars and the recorder, played by John’s wife, Fran Mallery. For an hour, tune choices are decided upon and played out beautifully, as musicians take turns with sets. Rounds of applause and smiles of appreciation fill the gaps between songs. Workshops including Celtic finger-style guitar and tune-centered gatherings, a lecture on the life of O’Carolan by Art Edelstein, breakouts and small sessions are followed by delicious main dishes and desserts. More performances follow the meal including spontaneous ensembles, step dances organized by Elizabeth Hunt Schwartz, contra dancing and soloists. Intoxicated by a long day of musical delights, all follow as John lights the bonfire at twilight. Gathered around in a circle, clasped hands lift to the sky in honor of the Feast of St. John. The bonfire blazes against a darkening sky, and a lovely day filled with the music composed by Turlough O’Carolan, comes to a close. What started as a gathering of friends interested in one Irish musician's music has blossomed into an annual event. On June 27, the third Carolan Festival will be held at the Mallery Farm in Worcester. Turlough Carolan (aka O'Carolan) was an Irish composer and harper from the late 17th and 18th centuries, a Catholic commoner in a land ruled at that time by Protestants. 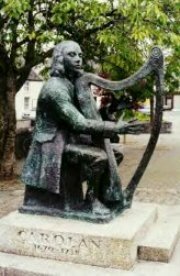 Carolan was blinded as a teenager by smallpox, yet he learned the brass-strung Irish harp and then rose to prominence as a composer in the years from 1691 to his death in 1738. Catholic and Protestant nobles alike befriended him during his career, playing and composing music for this segment of the Irish upper class. Carolan's music fell into obscurity after 1800 but was rediscovered in the 1960s by the famed Irish composer Sean O'Riada. The Chieftains, Ireland's famed traditional music ensemble, championed Carolan's music and helped spread his name. Today, Carolan's music is found on hundreds of recordings by musicians who play harp, guitar, violin, mandolin, piano, dulcimer and horn. His most recorded composition is "Sheebeg and Sheemore." Other melodies familiar to the public are "Fanny Power," "John Irwin," "George Brabazon" and "Bridget Cruise." The festival in Worcester remains primarily a gathering of Carolan aficionados and is a laid-back affair. As in the two past festivals, there will be music sessions where Carolan melodies will be played, several performances of Carolan music by local musicians, a dance, bonfire and potluck supper. Books about Carolan along with local musician CDs, featuring Carolan music, are also available. A donation is asked to defer the cost of tent rentals.